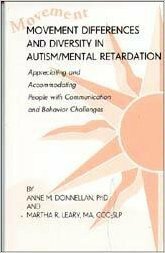 The authors use the term "autism/mental retardation" to refer to people who from early childhood have had significant difficulty in communication, controlling their behaviors and making themselves understood in standard ways.They suggest that many of their challenges come from movement differences. They stress that each person is unique and must be understood & supported in a very individual way. Anne Donnellan and Martha Leary demonstrate the neglected discipline of seeking a new pattern of understanding. They note anomalies, irregularities likely to be ignored or explained away in routine practice: irregularities such as the many accommodations people with disabilities have invented beneath the notice of the professionals who ordinarily control their treatment. Psychomotor disorders. From the Movin On series.